First of all, thanks for all your overwhelmingly honest and supportive comments on my last post! You sure know how to make a person feel like they are supported and not alone in this virtual world! 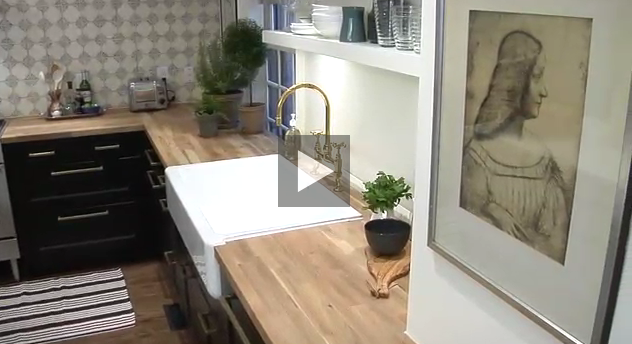 Now onto an amazing kitchen tour was in my inbox on Monday from Canadian House and Home Online TV that I had to share! Did you know you can subscribe to Canadian House and Home online TV? Then you get fabulous house tours, trend reports, DIY's all sent to your inbox! And don't forget, webisodes end up on the House and Home app, which I wrote about here, as well - so when you are sitting around bored and have your smartphone handy - you can watch delicious design TV! Since I live with my sad rental "stuck-in-the-90's-solid-oak-heaven-forbid-you-paint-oak" kitchen, I drool over kitchens that are a far cry from mine! There are no photos on the House and Home website yet, and the February 2012 issue has yet to arrive in my mailbox so I leave you with my screenshots and a link. Would you believe the cabinets are all from Ikea? Gorgeous Calcutta marble waterfall counter, something you would not expect to see in your quintessential country kitchen. I am noticing butcher block counter tops coming back....love the earthiness they bring to a space. Notice how they run the counter across the window! 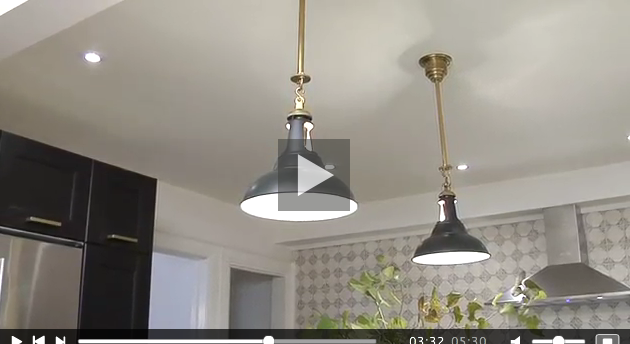 The gorgeous fixtures, a mix of black and brass. And that fabulous rustic tile, what is not to love? The open shelving with baskets and old bottles really give this kitchen that country feel. For those of you that know me, I LOVE black and white, this kitchen has the perfect balance of the two. Mixed in with a modern elements such as the amazing gooseneck brass faucet, marble counter, sleek hardware, apron front sink and few rustic touches, such as the industrial rustic stools, wood countertops, baskets, Delft-like tiles creates the most amazing blend! Can't wait for the issue to arrive in my mailbox! Beautiful! My hubby and I were just at Ikea yesterday, and commented about how awesome their kitchens are...reasonable but look so expensive! 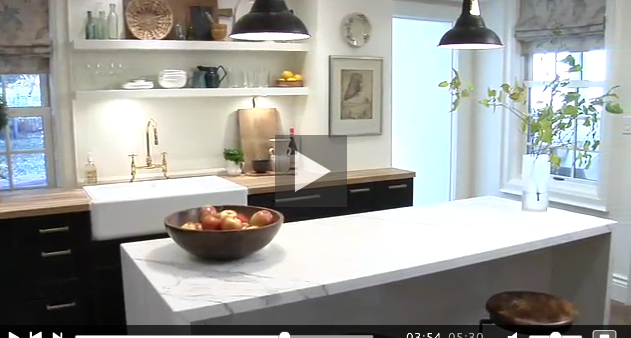 Ooh...Love the play of butcher block and marble surfaces, black and white. It's the perfect mix of masculine and feminine charm! Amazing kitchen Barb! I love waterfall counter!! swooning ...perfect balance for country chic! or urban farmhouse...whatever its amazing truly inspirational...thanks for the link! I was just drooling over this kitchen in the H&H magazine while I had my breakfast this morning! I always love black & white, especially with touches of brass... but those TILES!!! So unexpected... I don't usually go for that kind of thing, but it adds so much character to this space! p.s. thanks again just watched it and sent to my daughter as they are thinking of using butcher block from ikea! I love this kitchen! Butcherblock countertops are one of my favorites, and what's not to love about black and brass? So spectacular. That kitchen is perfection. There are so many images of kitchens online that I sometimes can't decide which style I really love but this captures it all. Beautiful!! What a stunner! I love black and white kitchens too. This one is artful and eclectic looking. Fresh modern country! Beautiful kitchen! 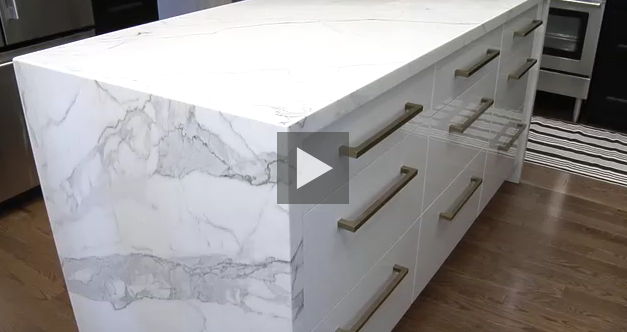 I love waterfall counter tops... they really elevate the cabinetry to the next level! Great attention to details here! I love, love, love this kitchen. It is the perfect combination of old and new, bling and natural elements, function and style. Amazing. Wow! Love that kitchen! Love the waterfall calcatta! What a great way to make the most impact with that slab! Love the crisp hardware, too. Thanks for sharing. I love this kitchen but the butcher block isn't a huge one for me. I grew up with laminate butcher block. Otherwise, the kitchen is fabulous. 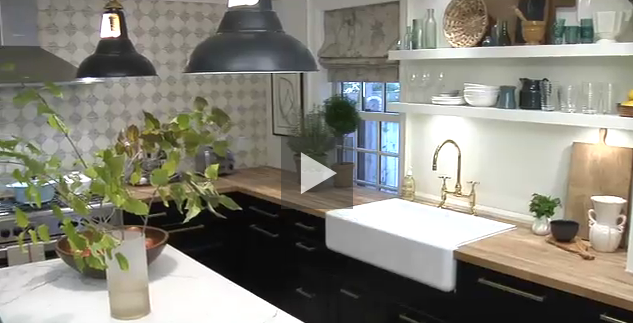 I love the black and white, love the backsplash, the hardware is a show piece. I love how some cabinets are black and some are white. There are no words to ever describe how much I like marble. Hi Barbara, I saw this episode recently, and LOVED this kitchen in the same way that you do. Perfect, perfect mix. Since we live without a TV, I so appreciate the online episodes from House and Home. I think it might be my favorite mag these days. I feel hard for this one. I've been trying to convince the mister that the almost-new builder cabinets need to be painted, and this gave me some serious leverage! The stove wall, with that enormous tiled backsplash, is my dream. Love it all.